My favourite rock and roll moment of 2007 was at a Bon Savants concert. At the end of their show at the Paradise Rock Club in Boston, frontman Thom Moran (everybody’s favourite rocket scientist) lifted his guitar over his head like a – literal – axe to mock-smash it down on the stage, in an homage-slash-parody to hard rockin’ guitarists everywhere. Unfortunately, its trajectory took it straight into a mirror ball hanging above him, and shards of glittering glass confetti’ed down onto the stage. The best part was the look on his face – any semblance of rock poseur was gone, and it was pure little boy, just got caught stealing cookies and worried about getting in trouble with mum. Guilty looks aside, the Bon Savants play thoughtful, tuneful, sophisticated pop, mostly about love and loss but interwoven with scientific and other metaphors. Their self-released debut album, Post-Rock Defends the Nation, has been occupying a CD slot in my car stereo for most of the year. The standout track remains ‘Between the Moon and the Ocean,’ with ‘Mass Ave and Broadway’ a close second (despite the lyrics that refer to Porter Square as located at that intersection; in reality, Porter Square, Cambridge is at the intersection of Mass Ave and Somerville Ave). 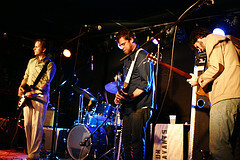 Image: Bon Savants at the Mercury Lounge, New York, in June 2007. Photo by Maryanne Ventrice, reposted here under its Creative Commons license.